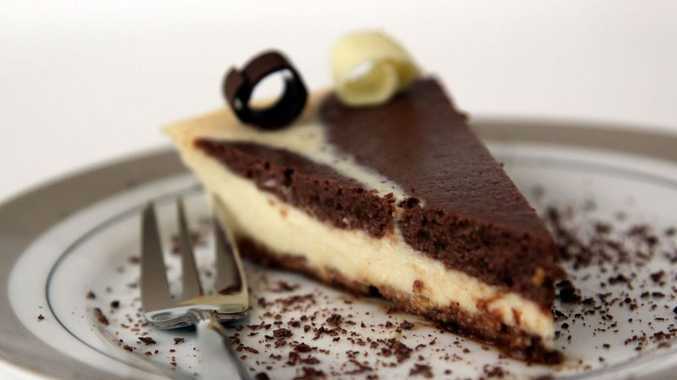 TRY this delicious cookies and cream baked cheesecake recipe from Annette Sym's Symply Too Good To Be True book six. Preheat oven 160ºC fan forced. To make base: In a food processor crumble biscuits until fine crumbs appear. Add in milk and blend together. Coat a pie plate with cooking spray and press biscuit mix onto base of plate. Refrigerate while making the filling. To make filling: Clean food processor bowl and blade. Blend cottage cheese in processor until very smooth. Add cream cheese, vanilla essence and eggs and combine well. Pour into a large bowl then add condensed milk. Combine well using an electric beater. Pour half of the filling into another bowl. Add grated chocolate and sifted cocoa to one of the bowls and combine using electric beater. Pour the white filling over biscuit base then carefully pour the chocolate filling in a zig zag pattern. Bake for 45 minutes. Leave to cool. Refrigerate until required. Note from Annette: I am so excited about this recipe. Who doesn't love anything to do with cookies and cream, and now you can enjoy this delightfully guilt free cheesecake. You don't get a huge serve, but it is quite rich, so remember everything in moderation is the key to weightloss success. up to 20%, which much of is saturated fat. If you have diabetes only have this on very special occasions as it contains significant calories and carbs.